Enterprise Server contains various default metadata properties, and allows to add new properties (referred to as custom properties) any time these are needed. Example: Part of the integration of Adobe DPS in Enterprise Server involves adding several custom properties so that files in Enterprise can be matched with functionality in DPS. Step 1. 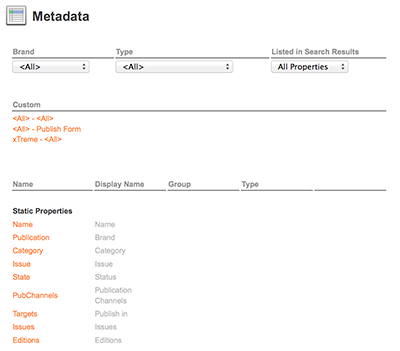 In Enterprise Server, access the Metadata Maintenance page. Click Metadata in the Maintenance menu or on the Home page. The Metadata Maintenance page appears. Step 2. Make sure that the Brand list and Type list both show All. Although custom properties can be added to a specific Brand and Type combination by making choices from the lists, this method is not recommended. A more effective way of doing this is during the process of assigning the property to a dialog box. Query Criteria and Result Column lists can only include fields defined at the global level (created at the 'All' (Brand) - 'All '(Type) level). Custom metadata fields should be defined at this level if users will need to search on those fields or display them as result columns. Fields should only be created for a specific Brand or asset type if their use will be limited to the Properties dialog or where the access to a given field is only through an automated process such as an API, custom server-side script, custom plug-in, and so on. Scenario: a Brand is chosen from the list and a custom property is created with a specific name. Next, another Brand is chosen from the list and another custom property is created with the same name as the one created for the other Brand. This scenario is supported but only if the type of both properties is the same. A use case is when 2 lists need to be created but each list needs to hold different values. For example: you could create 2 different custom properties named 'Languages' and the list of one property could hold different languages than the list of the other property. 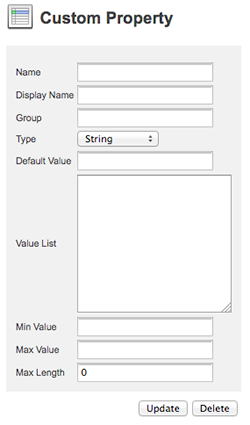 Note though that it is recommended to use unique and descriptive names for each custom property; this will make it easier to manage them and will at the same time prevent possible system conflicts. Step 3. Scroll to the bottom of the page and click Add Custom Property. The Custom property page appears. Name. Should start with a capital letter, not contain any spaces, and may not start with a number. Valid characters: a-z, A-Z, 0-9, or _. Display name. Name used for displaying the property in the client user interfaces. Group. When filled, the property will be shown in Workflow dialog boxes on a separate tab control. If left blank the property will be placed on the General tab together with all other properties. Figure: In this scenario, the custom property named 'Intent' is added to a separate tab in the Image Properties dialog box. String. Any sequence of characters. Multiline. Input can be displayed on multiple lines. Double. Decimal numbers, for example 1.56. Note: The min, max or default values are used for determining the precision. Example: To have a precision of 4 decimal values, enter 0.9999. Note: The format to follow is that of the LANGPATDATE option as defined in the configserver.php file. See Controlling the way the date is displayed. 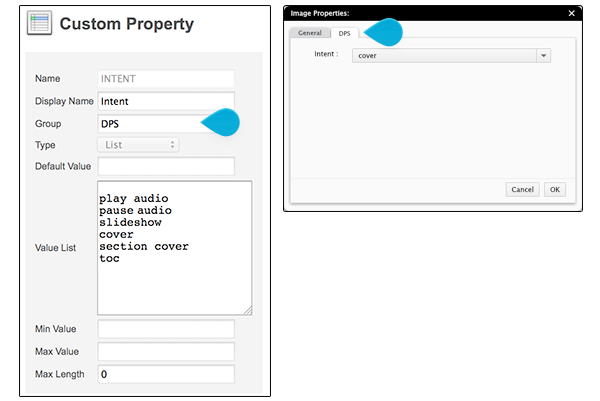 Note: The format to follow is that of the LANGPATAMPM option as defined in the configserver.php file. See Controlling the way the time is displayed. Default value. Default property value. Value list. List of values that a list or drop-down list should hold. Min value. The minimum value. Used for numeric values. Max value. The maximum value. Used for numeric values. Max length. The maximum length that the value can have. Used for strings. Step 6. Click the Left Arrow icon to return to the Metadata page. After adding a custom property, you want to make it available to the end users. This is typically done by adding it to a Workflow dialog box. 20 September 2018: Updated the notes of step 2.